Fearow is a dual-type normal / flying type Pokemon who evolves from Spearow. 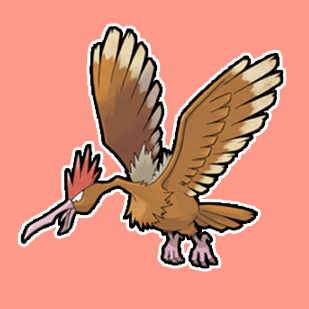 Fearow looks like a vulture, although he has beautiful wings. 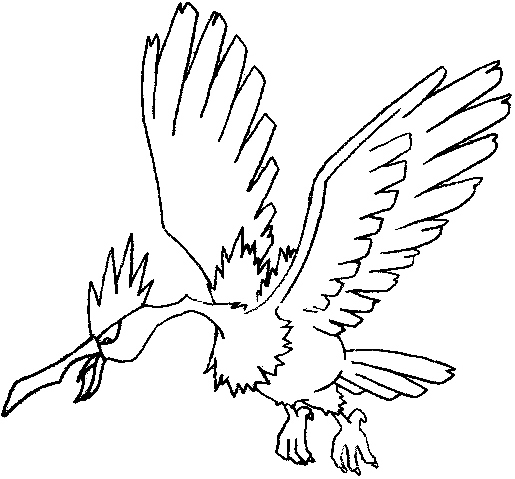 Learn how to draw Fearow with easy to follow, step by step instructions. Start off with a small circle with guidelines thru it to place facial features. 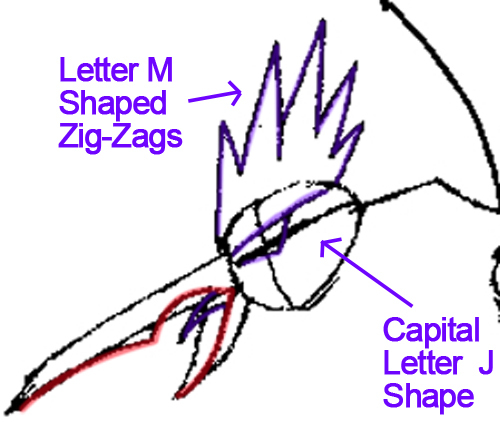 Draw the beak…you can draw a letter ‘T’ shape (I highlighted it in blue)…and then draw 2 curved lines around it. 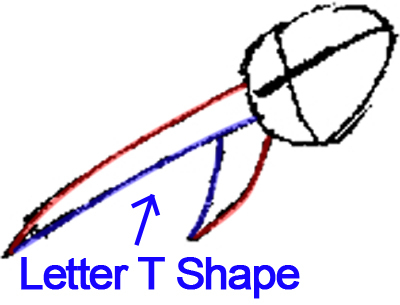 Draw a capsule shape connected by an “L” line to the head. That line will be Fearow’s crooked neck. Add a rounded triangle at the back for the tail. Draw some flat paddle-like shapes at the bottom for the feet. If you have problems drawing them, then you will notice that they can be formed by drawing a #2-like shape and a question mark shape…and one other line. 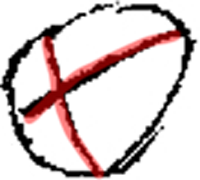 Draw two large bunny-ears-shapes at the top for the wings. 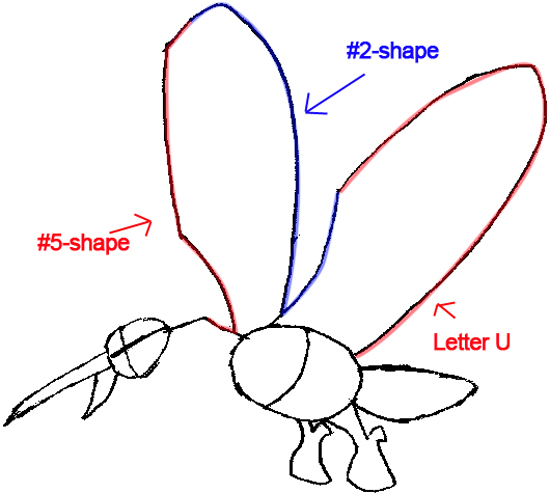 I show you above that there are basic shapes that make up these wings – a #5, a #2, and a letter U. Add some spiked hair tot he top for the head. Draw a small “V” inside the mouth for his tongue. Outline the guideline that we drew for the neck in one of the first steps. Add some frizzly feathers to the base of the neck. 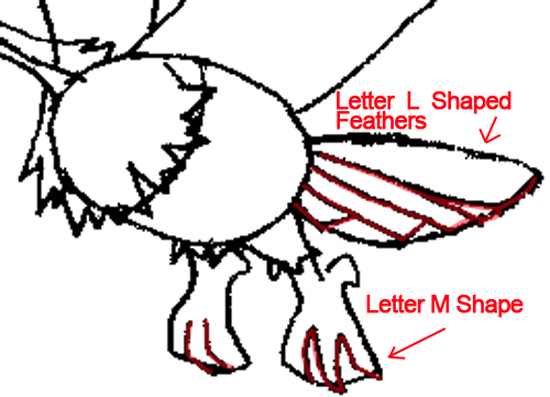 Draw some lines at the tail to define the feathers (basically letter ‘L’-like shapes). Draw the three toes on the feet…the right foot’s claws are drawn with a letter ‘M’ shape. Add some feather details to the wings. 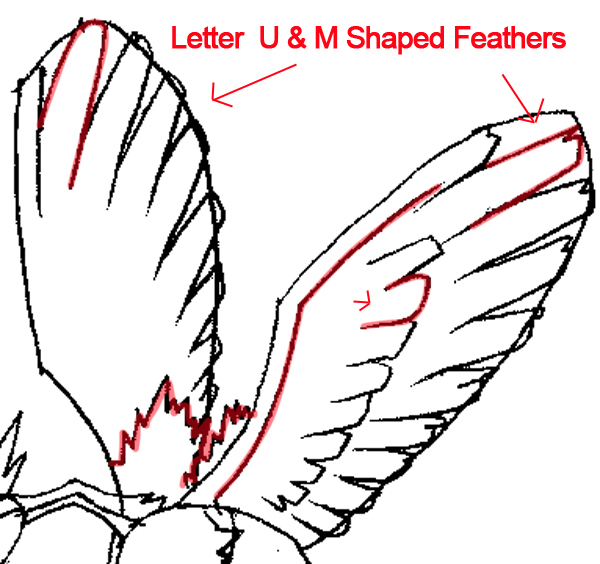 Keep in mind that Fearow has two layers of feathers in his wings. Add the eyes, erase your guide lines and you’re done! I forgot to tell you to draw an oval in the eye region for the pupil. I hope that your drawing of a Fearow turned out perfectly. I know he was a little difficult to draw. If you were able to draw him well, than you are a natural drawer. Just keep practicing if you are having problems. 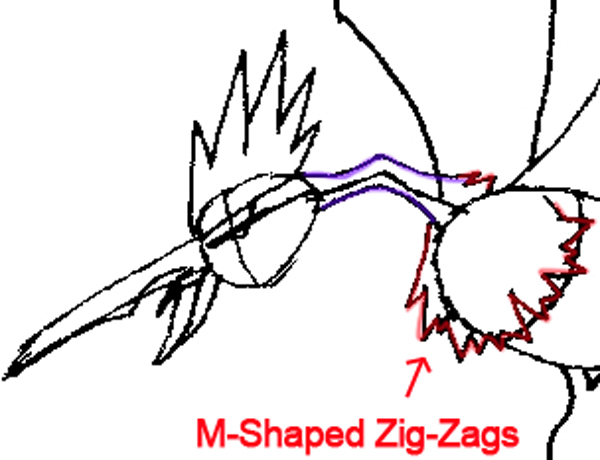 Come back for many more Pokemon drawing tutorials…as well as other drawing lessons. This article was written on 18 Jan 2014, and is filled under Manga TV Shows, Pokemon.